Welcome to Park Folsom Senior Retirement Community living for seniors. Park Folsom offers all the comforts of home with features added that provide the support and security our residents need. Residents enjoy the quiet comforts of independent living at home without the burdens of maintaining it. Your needs regarding meals, room cleaning, transportation and entertainment will be taken care of by our staff. Residents are invited to take part in a variety of social activities which include: social events and outings, movies, crafts, bingo, exercise sessions and more. All apartments include individual heating and air-conditioning, wall-to-wall carpeting, kitchenette, and ample closet and storage space. Park Folsom is a place where family is important. When your loved one moves into Park Folsom, your family becomes our family. We are committed to providing you the peace of mind in your decision to choose us, both for your loved one and for your family. We all want the best for our families: a comfortable and secure place to live, nutritious meals, social events, and a competent and caring staff. Park Folsom is designed to provide all of these things. 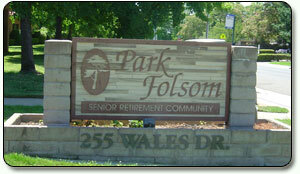 Park Folsom is conveniently located in Folsom, CA, just minutes from Old Town Folsom. Hospitals are nearby with modern medical facilities. 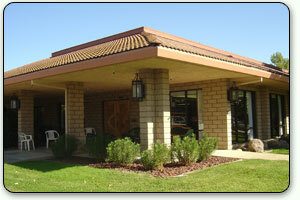 Many other health care professionals are also conveniently located in the area. Transportation to doctors in our air-conditioned van is available. We welcome you to experience our refreshing home-like atmosphere with the professional support only a specialized care giving residence can provide. We invite you to experience the creative, compassionate, and heart-warming atmosphere at Park Folsom. Discover why Park Folsom Senior Retirement Community is a great place to call home.